Social media banking. ING Direct Canada, led by its social CEO Peter Aceto, became one of the most engaging banks on social media. The bank aims to bring transparency in banking. A few days ago, I noticed this video on social media banking on Hootsuite’s youtube channel. I invite you to watch ‘Using Social Media For Transparency: The ING DIRECT Story‘. It gives us a unique opportunity to find out more about the ING Direct team, the people engaging with their banking customers on daily basis on the most popular social media channels likes of facebook and twitter. Please find below the description as available on the Hootsuite youtube video page. What do your customers like, or not like about you? Do you know? And how are you using this information to change the way you run your business? This is the the kind of innovative thinking that drives the social strategy of ING DIRECTCanada’s leading direct bank since 1997 helping them offer better service, more savings, and a smoother banking experience. For a company like ING DIRECT, it should come as no surprise that social media is a huge part of their day-to-day business. 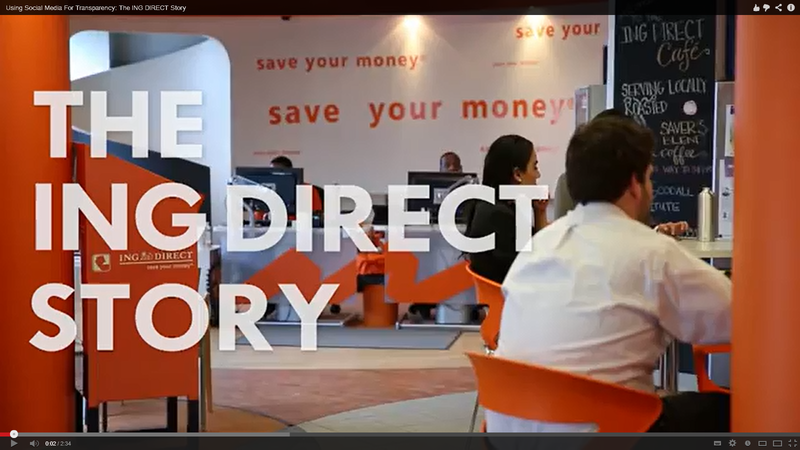 In this video, learn how ING DIRECT creates better business interactions using social media using networks like Facebook, Twitter, and Instagram to inform their financial products and grow their clientele. Also hear from their CEO Peter Aceto, who explains why he thinks social media is an integral part of any successful company. I am a huge fan of Peter Aceto and his commitment to drive employee advocacy and connect with his banking customers. So, what do you make of the ING Direct Story? Does your bank have a similar approach to social media in banking? I invite you to share your thoughts on social media in financial services here or on twitter.